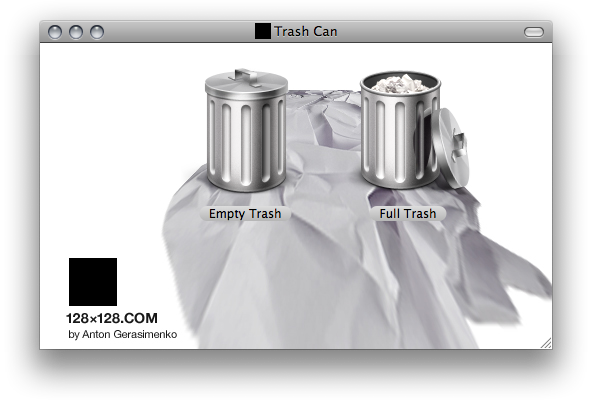 Here’s a good looking Trash icon if you are going for the Classic Macintosh look. Icon’s available for both Windows and Macintosh. Update: Since the original site is down, you can download it here until the site is restored. someone’s birthday coming soon… hehehehe… eww, red text… dude, change man, change! I’ve added the file to this site until the author’s restores his website. Enjoy! I’d like to download the icon, the only issue i’m having is that the png file can’t be downloaded because while downloading the png file the server cannot be found although my network is really good. Do any of you guys perhaps have it for me, i’d like to have the trashcan icon. Looks great!